Starfinder has been a pleasant surprise to me as a tabletop gamer ever since its launch at Gen Con 2017. While there were other sci-fi and space-themed roleplaying games out there, none of them were as readily available or easy to transition to (in my opinion) as Starfinder was. The continued support of a system like Starfinder, where the core rules leave rooms for lightyears of expansions and additions, is incredibly important. 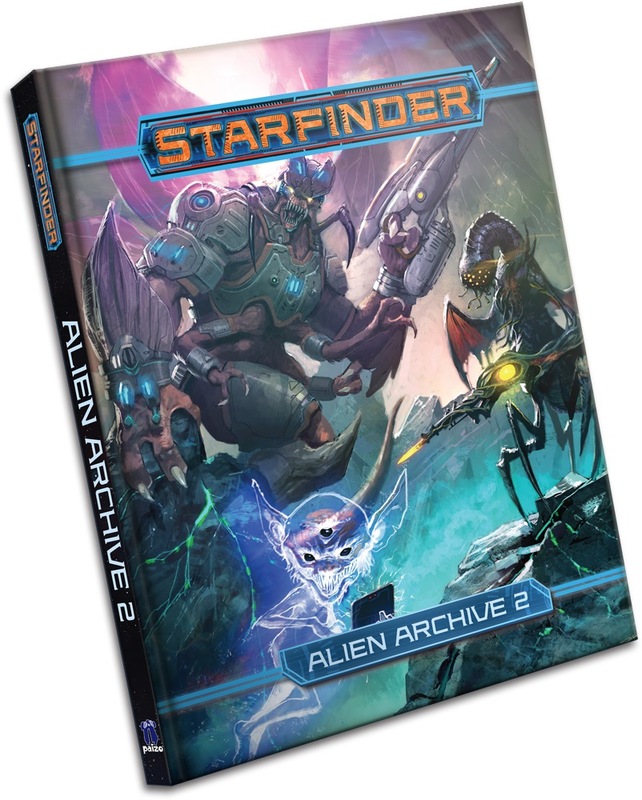 Within the first year alone, Starfinder supported their core rule book with the Alien Archive and the Armoury supplements. In addition to that, they have tweaked and issued errata for the few parts of the system that needed some tweaking. All that being said, I had high hopes for Alien Archive 2. I’m happy to say that my hopes were not only met, but exceeded. Alien Archive 2 delivers what most Paizo customers will be familiar with in terms of a supplemental book. From front to back, the book is chock full of stat blocks and rules additions for the base system. While a lot of parallels can be drawn between a Bestiary and Alien Archive 2, the later goes one step further by including SOMETHING for every creature they list in the book. These somethings range from weapons, to ships to stats for playing the aliens yourself. They’ve made sure that each entry can add to your game more so than just an enemy. Specific blasters or armor that an alien race uses can actually be taken off their dead bodies and used by player characters. It’s a small detail but the level of immersion this can add to a game is huge. Also, who wouldn’t want to play as a bi-pedal bear person in space? A+ Paizo. The second big thing I want to talk about here is the organization of this book. First of all, in the upper right hand corner of every right page there’s a little picture of what monster is on that page spread. It’s a little detail but it makes it incredibly easy to look through and find the monster I’m looking for quickly. Secondly, each monster stat block as one or more icons next to them. These icons aren’t necessary for reading the monster’s stats, but they describe what the monster is capable of. You have an arcane symbol, a mind effecting symbol and a physical damage symbol. Again, this is a small thing to add but is hugely helpful for GMs using the book. I’m a huge fan of little organizational touches like this. They go a long way in helping to make a book more of a tool than a reference. As far as issues with the actual book go, I don’t have too many gripes. The only thing that makes me a little upset is that Alien Archive 2 is the third supplemental book for Starfinder. It’s a great book and I’m happy to add it to my library, but I feel like Starfinder would benefit from expanding some of the other aspects of the system. A book with more ships and optional rules for ship combat would be super interesting. A new class or two with expanded options for the ones that exist would be very fun. While Alien Archive 2 definitely added more than monsters, we had just received a book of weapons in the Armoury book and I doubt people have played all the playable races from the first Alien Archive. Of course I’m happy with Alien Archive 2, I just am more excited to see Starfinder branch out and diversify their entire system with options. Hopefully the next few supplements will do just that.